Chromebook Care: Reminders for Students | Learn. Create. Share. Many students learn and adapt to technology with little effort. They are very comfortable using devices... sometimes too comfortable. 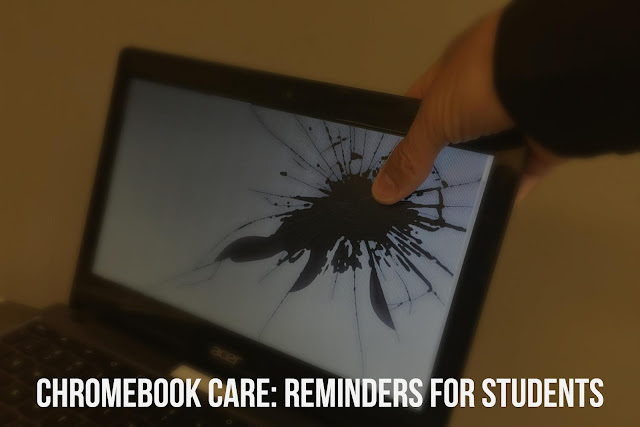 It’s important to give students frequent reminders about proper handling and care. Look for opportunities to praise students who use technology responsibly. The video demonstration and expectations listed below can be helpful references and reminders for students of all ages. ➊ Carry your Chromebook with two hands on the sides of the keyboard. The most frequent Chromebook damage is a broken screen. The most common cause is picking up the device by the screen. The screen can flex and crack with too much pressure. ❷ Position your Chromebook safely on your desk. Close the lid when not in use. A Chromebook hanging off the edge of a desk is more likely to drop than one placed safely in the center. Prevent additional accidents by closing the screen lid when not in use. ❸ The floor is a dangerous spot for your Chromebook. Keep it in a safer place. It’s common for students to put books on the floor in the classroom or hallway by their lockers. Technology breaks when it is stepped on; find a safe place to set your devices. For more information about Chromebook care, expectations, and digital citizenship, visit the Student Resources page under the Powerful Learning website.